"I want to see you now. I want you to come to me." We Are Now Beginning Our Descent is a well crafted and constructed novel that gets inside the head of Adam Kellas as he is lead by an e-mail and a small memory of Astrid, a former girlfriend, that has "crossed into him." James Meek paints the love story between Kellas & Astrid against the backdrop of Afghanistan, London and America. Similar in places to the style of George Orwell, James blurs the political into the human story to show floundering love and war, mixed up and acting upon each other. He does this by cleverly showing us the modern vantage point of war, where F-18 pilots fly over Afghanistan and as they release their bombs, "perceive the human grain making up the fabric of the view," but never land - only reaching out and touching with destruction. He then forces Kellas to crash land from his orbit as a war reporter in Afghanistan and to reach out and touch Astrid's life. Kellas has built up memories of her that he has fallen in love with and as he is eventually forced to fit the real woman into the fragments of her that live within him. "You have to make your own lover before you can know her ... But you've got to leave space for the real woman to grow inside." We then watch to see if his touch is destructive or one of love. On his way Kellas, in trying to convey what the war in Afghanistan is like, reaches out to his friends in London and brings destruction. "There was curiosity in that reach, and a kind of regret. In any act of hurting there remained the ghost of intimacy." And unlike laser guided missiles, Kellas struggles to cope with his feelings, "Your own mind (is) a hard thing to manipulate: it had so many automatic processes." At the end Meek pulls back out from our intimacy with Kellas and we are left watching him from afar. You feel as Meek has helped us to connect with his character and in doing so connect with the political arena that requires more from us of saying "we care" with no action, no feeling, no connection. 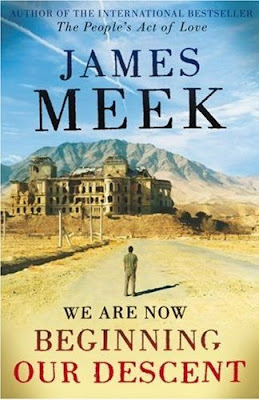 Coming this week: The View From Here interview with James Meek. Between you and Paul recommending books, my must-read list has grown to overwhelming proportions. Looking forward to the interview, Mike ... and delighted that Stella is under pressure with her must-read list. I don't feel so alone now. I've read nothing but high praise in the press, and from more personal reports, wonder and pleasure by those who've already managed to read this book. What I haven't seen before are the irresistible quotes you offered, Mike. How I'd love to read the novel before your interview. With luck I may have started it. Either way, I've been waiting for this.